Father Frost (no, he’s not Santa!) is an intermediate-level counted canvas design that you will most likely want to finish as a standing figure. He stands about 11” tall, and is covered with fabulous stitches, beads and Swarovski crystals. You will not only learn some interesting and unusual stitches, but you will also learn about combining threads, mirror imaging stitches, shading in patterns, and attachment of various beads and crystals. The finished design project is about 11” tall and 8“ wide at the base. The working canvas is 13” x 16” inches. 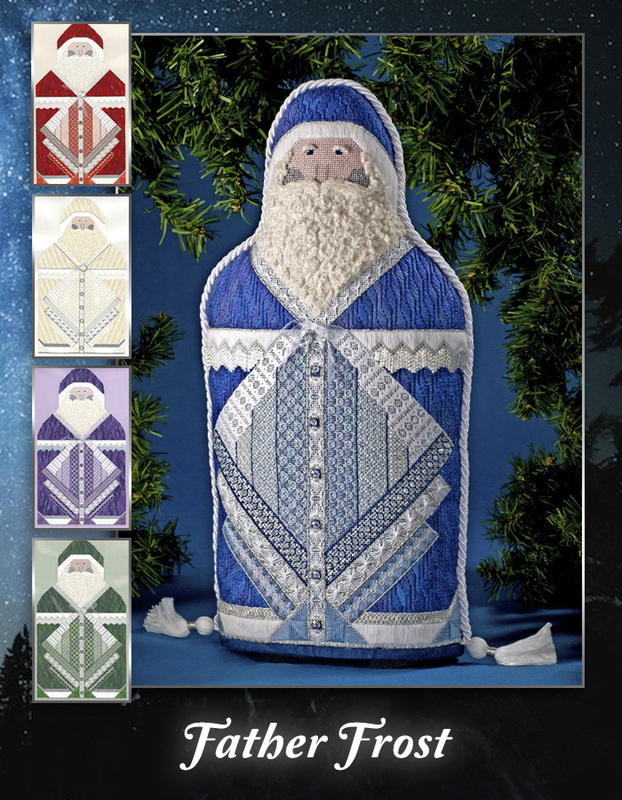 You can stitch him in blue, which was the original, but thread lists are included for red, green, purple, and creamy white. These fabulous figures are worked on 18-mono canvas, in overdyes from the Caron Collection, Kreinik and Rainbow Gallery metallics, with lots of Swarovski crystals, seed beads, and twisted bugles, finished with a Swarovski snowflake around his collar. Threads include: Waterolours, Waterlilies, Kreinik #8 braid, Rainbow Angora, Grandeur, Pebbly Perle, Mandarin floss, silk chenille, Crystal Braid, Nordic Gold, Tiara, Treasure Braid, and Soie d’alger. Stitches used in the design include: free-form Rhodes, double fans and regular fans, fan eyelet, Scotch, braided knitting, Jessica, lattice work, diamond couching pattern, flat star stitch, Sprats head, hourglass pattern couching, twisted double fans, giant wheat stitch, outline stitch, Nobuko, Amadeus, packed stem stitch, Bunger stitch and more.